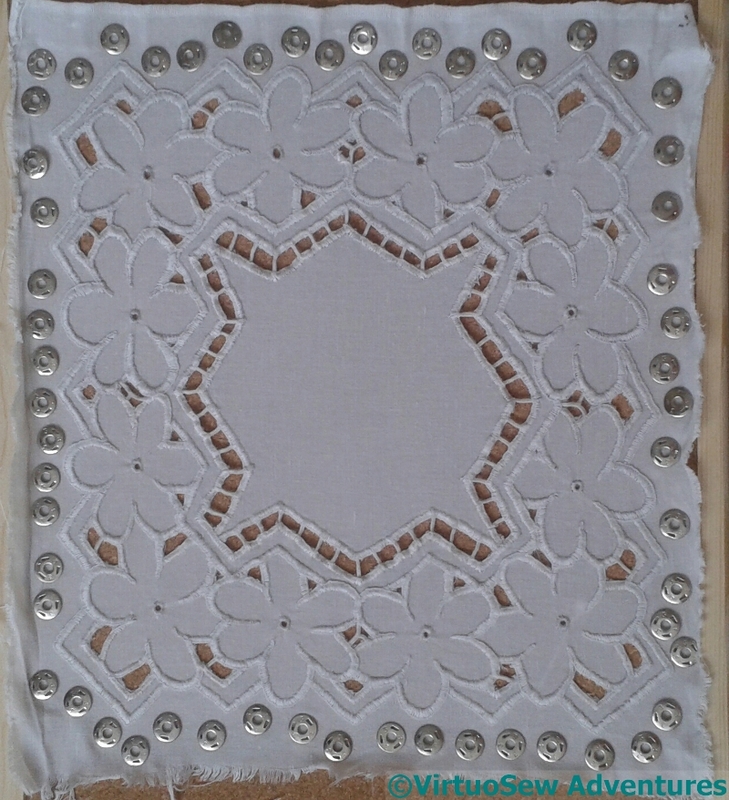 Azorean Cutwork Finished At Last! 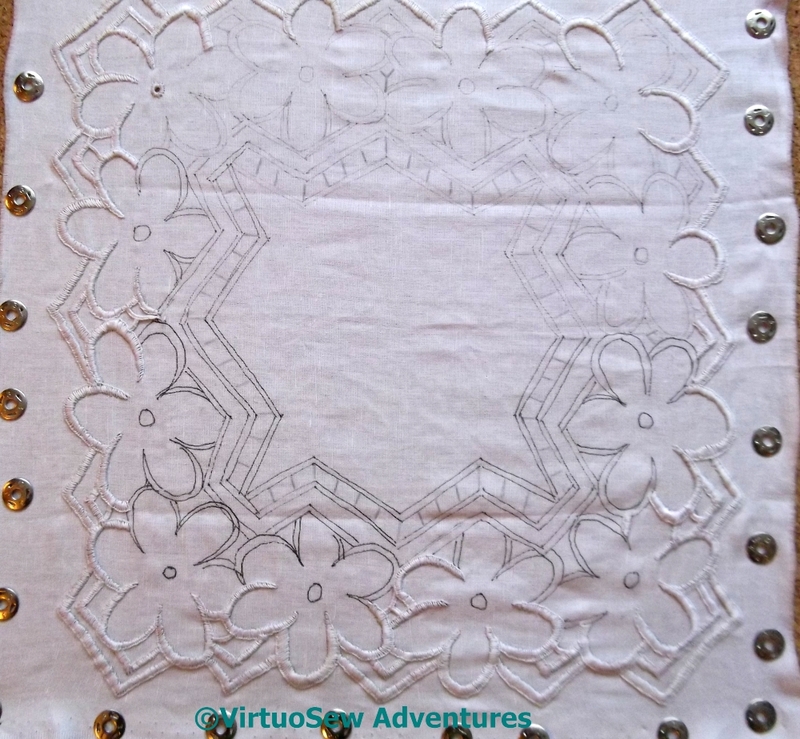 It has taken a long time, but I have finally finished the miles of close blanket stitch, the buttonhole bars, and the eyelets on the Azorean Cutwork, which I began in 2013. The idea was that it would be a good travelling project, but it really wasn’t. White on white rather needs good light, and good light is one of the things I rarely get when travelling. I threw it in the washing machine, and stretched it on a cork board as soon as it came out. Already it is looking better! 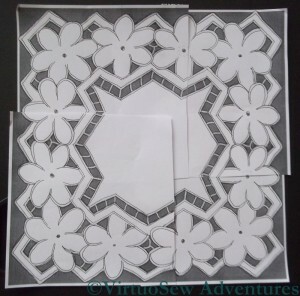 The next stage was to cut out all of the internal spaces, and then wash and stretch the piece again. 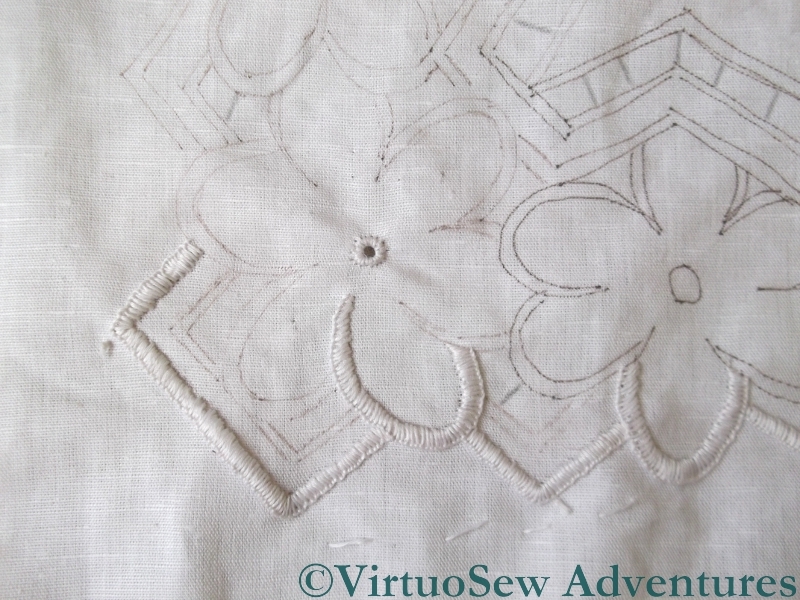 The cutting is fiddly, and a bit anxious (what if I cut through one of those buttonhole bars? what if I cut through one of the edges?) and it seemed to me that it would be a good idea to be able to stretch it out to see whether I had damaged something. The edges allowed me to do that. Some of the sections I was plainly too nervous to cut out well enough, so I was also hoping that agitation in the washing machine would help settle the stitching and slightly fray the edges that need more trimming. Then there was some repairing to do. This wasn’t the only section that needed repair, and they actually didn’t take that long, but there were a few growls, all the same! Next I had to trim the edges. The challenge lay in finding the right pair of scissors. I have loads of pairs, but what I really need is a sharpener. 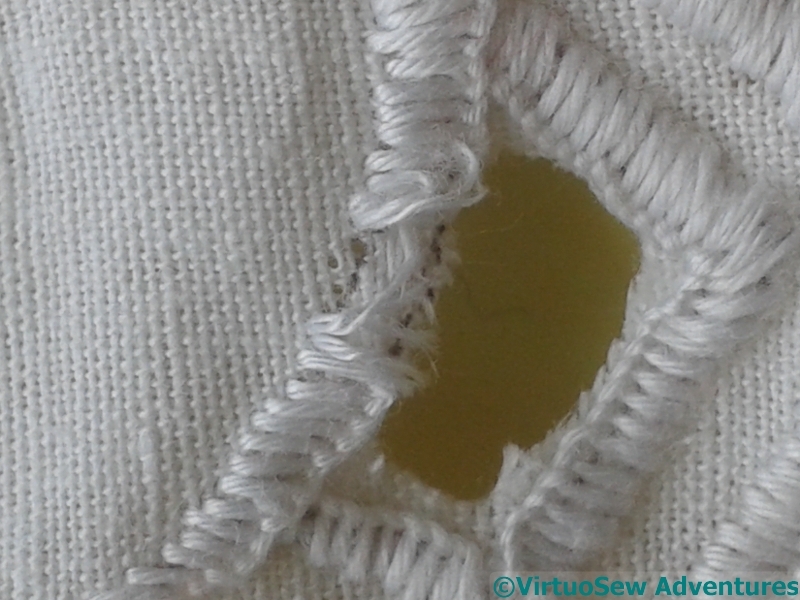 So many of them are only sharp at one part of the blade, and then the fabric simply gets chewed. “The scissors ate my homework” may sound eccentric, but it certainly felt like that! Washed (yet again!) and ironed, I have finally finished it! I may have some more repairs to do, when it’s had a little use, but in the meantime, it was an interesting exercise, if rather more fun in retrospect than it was at the time. I would do the buttonhole bars differently another time – they went too deeply into the borders, and caused a lot of muttering! Recently we had a visit from some Portuguese friends, who we last saw when we were in the Azores. They had obviously remembered my delight when I found the embroidery shop in the main square at Punta Delgarda, because for their hostess gift, as well as bringing some coffee and olive oil, they brought a set of vintage Portuguese sewing and embroidery patterns! 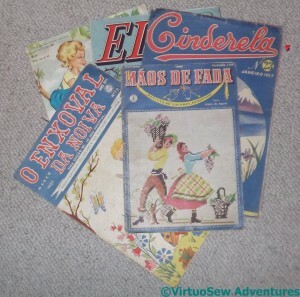 Although they look like magazines, each one is in fact a large sheet that unfolds to provide drawn-out patterns for a multitude of types of embroidery, including surface embroidery, appliqué, cutwork and drawn thread work, some of it crisp and simple, some of it bright, colourful and really quite ornate. 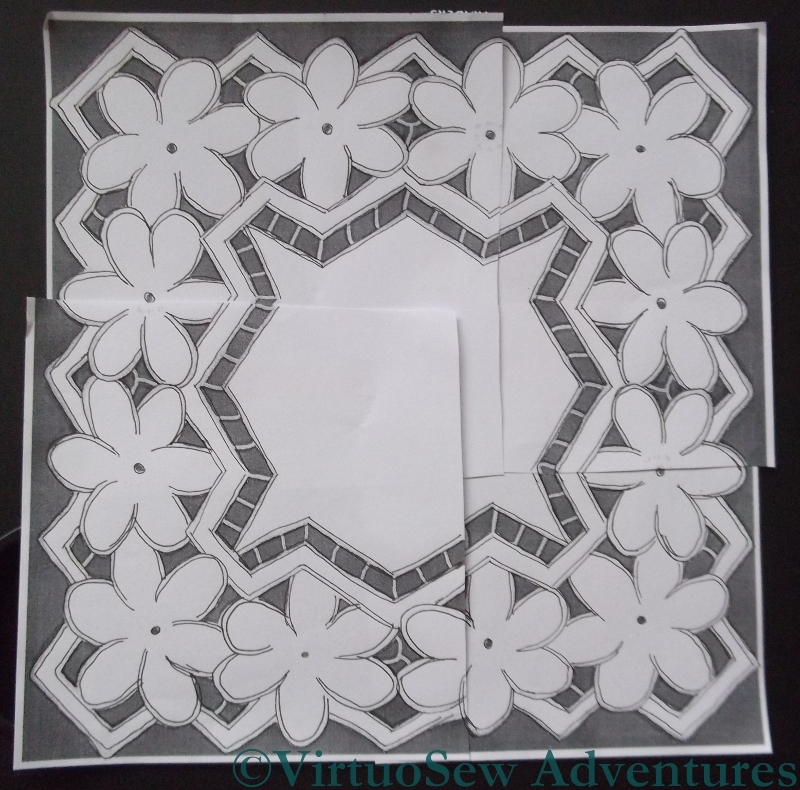 Suggested applications for the designs appear as well, so next time my inspiration flags (er, and I’ve finished the Azorean Cutwork! ), I will be able to leaf through these to refresh it! 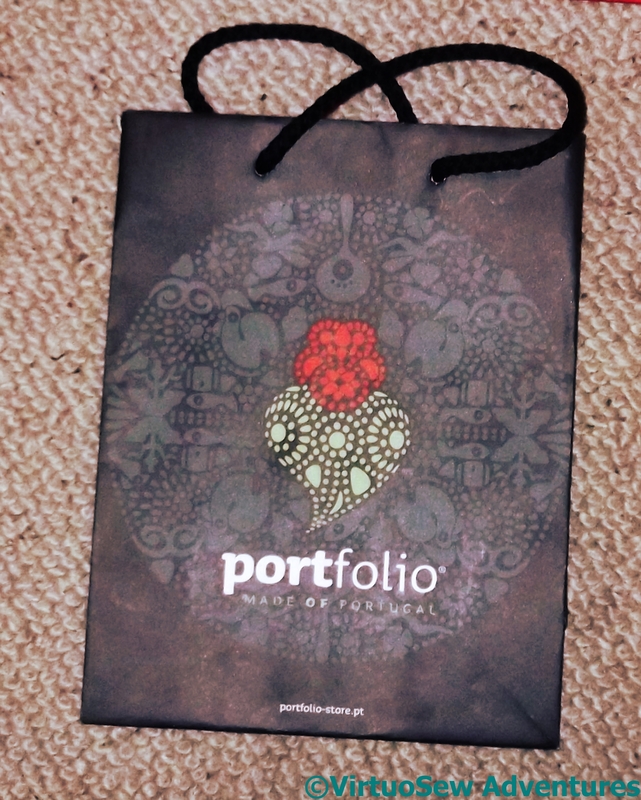 The coffee was presented in this paper bag, which is printed with a design that our friends told us is inspired by a traditional embroidery pattern from northern Portugal. They said they were disappointed not to have found some embroidery for me, but in some ways, I think this is even better. One of these days I will be able to play with this design, and maybe reinterpret this traditional style in my own way. 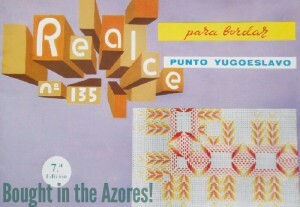 You may recall that when we visited the Azores, I found an embroidery shop, and bought myself some fabric and thread, and a book of patterns. I’ve now finished the outside edge of the piece, which means that I can stop worrying about the potential for the piece to fray. 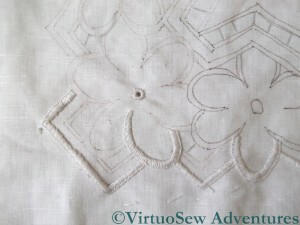 My buttonhole stitch isn’t entirely consistent in width, but now I’ve pinned it out to look at it, I suspect that isn’t going to matter very much when the piece is finished. I haven’t damp-stretched it (with apologies to Karen!) because I’m not entirely confident that the drawn line will survive washing, and I really don’t want to have to draw it yet again! 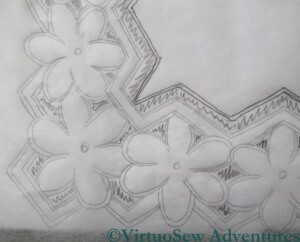 I’m continuing to work around the perimeter, rather than working each flower individually. I’ve commented before that I don’t much enjoy repetition, so as I go around the perimeter I alternate between curved and straight lines, no buttonhole bars and adding buttonhole bars, which keeps me a bit more interested. Not least of the (underrated!) skills involved in embroidery is managing longer-timescale projects in order to make sure that they do in fact get finished. 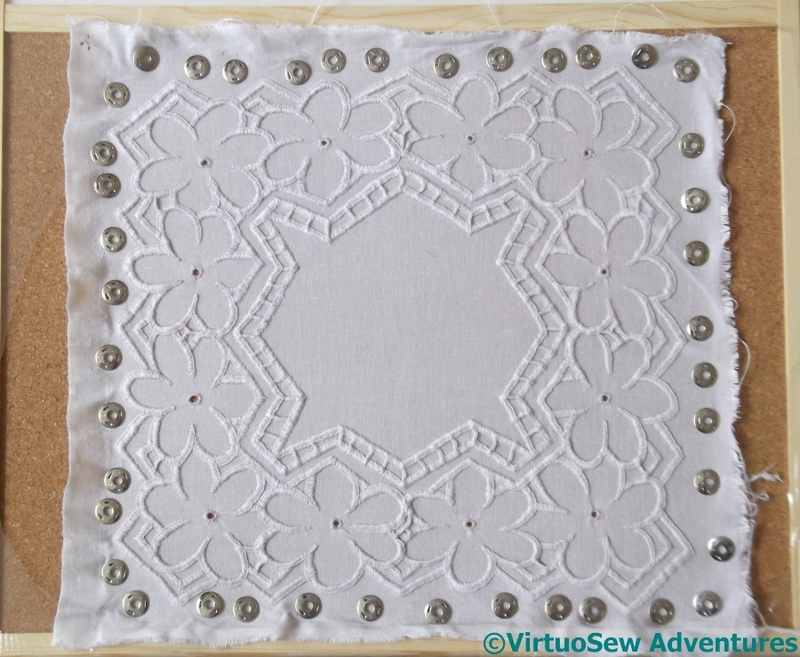 I’m pleased that – in spite of the fact that this is essentially my embroidery project for when I don’t have good enough light for my big projects! – I’m making slow but steady progress with it. However, my next task is to write my shopping list for my visit to the Harrogate Knitting and Stitching Show. 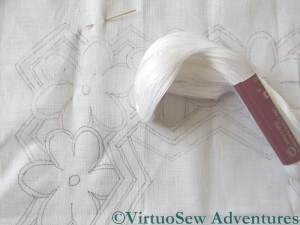 Over the years, I’ve often bought things with a project in mind, and then found the project changing when I come to think about it seriously, so I am trying to be a bit more organised and disciplined this time – while still leaving some leeway for the odd enthusiastic impulse purchase! 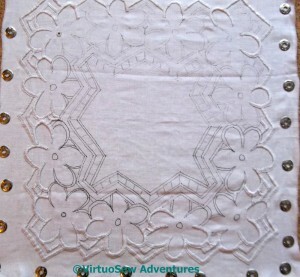 At long last, after much drafting, redrafting, pricking, pouncing, and outlining, the cutwork design I have planned to work using one of the patterns I found in the Azores is ready for me to start the embroidery. After all this effort – the prick and pounce transfer method isn’t good for a healing tennis elbow! – I do hope I enjoy working it. 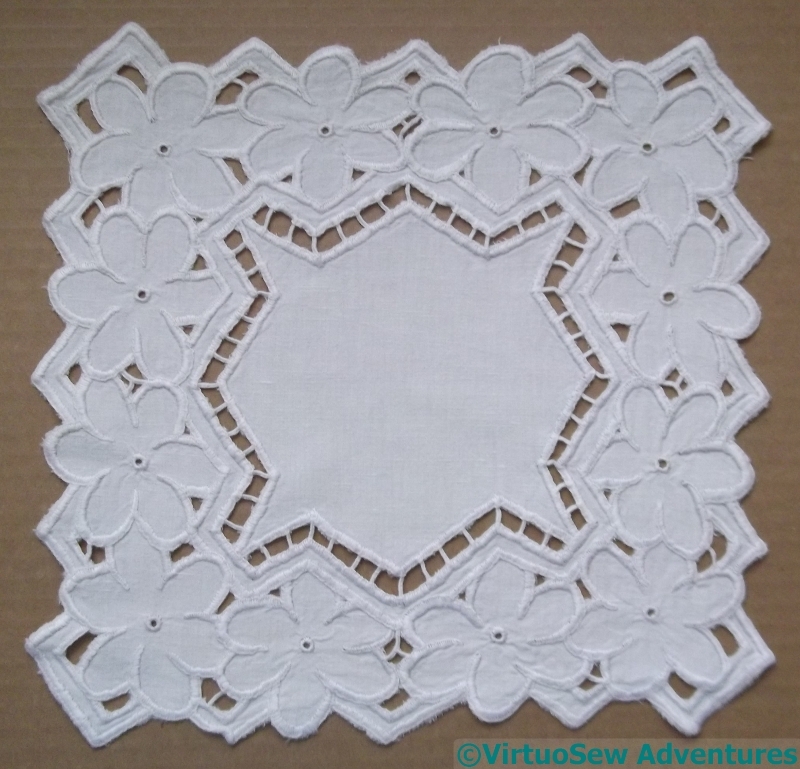 It is only the second cutwork piece I’ve ever attempted – and the first came by accident in a bundle from eBay! 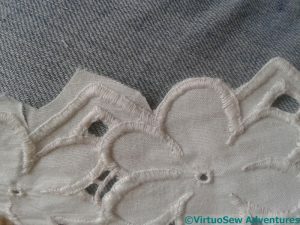 One of the things that attracted me to the design was the chance to get to grips with multi-ended buttonhole bars. 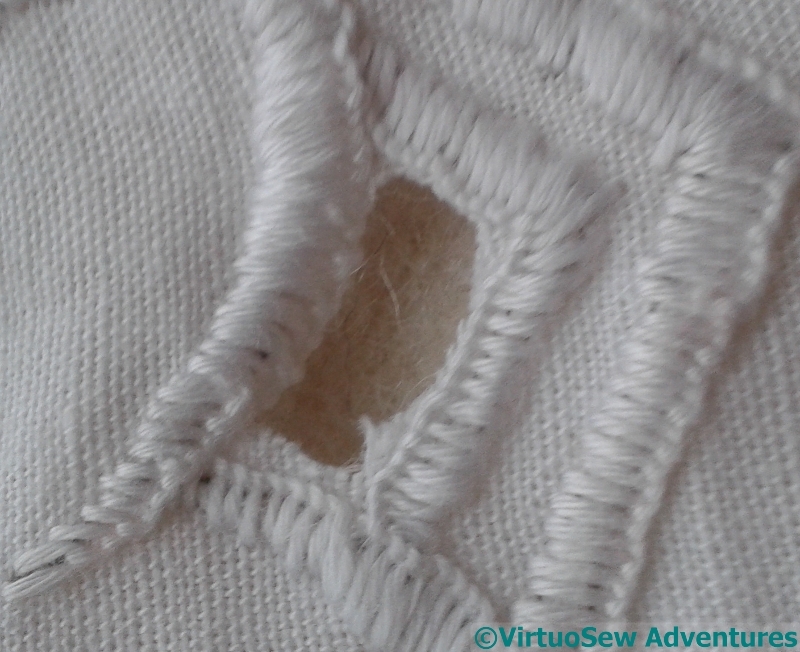 I know that somewhere in my shelves of embroidery books, there is one detailing how these Y-shaped buttonhole bars should be worked, but in which? I’m going to start by working the external edges, while I spend time rummaging among my references. This will ensure that it will not matter how long the rest of the piece takes, because the edges won’t be able to fray – although in fact I think there is little danger of that. It is a very good quality, firm fabric, and I’m rather enjoying myself. I’ve even done my very first eyelet, using a bone stiletto from the set Elmsley Rose gave me for a birthday present a few years ago. I have been working on my Azorean embroidery of late. 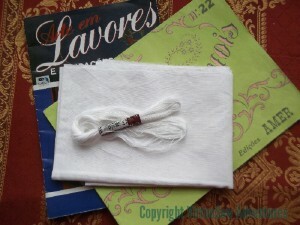 By this I do not mean that I’ve been actually using my needle and thread. No, I’m not there yet! 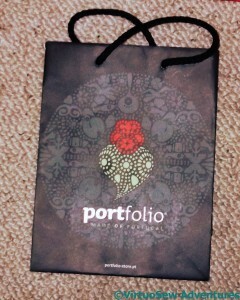 Remember, what I bought in that enchanting little shop in Ponta Delgada was a pattenbook, in effect. It included no tracings, and no guidance for creating the design I will work from. The design isn’t drawn out, but simply photographed – in each case there is a corner of the finished article showing in the photograph, but not how each section joins on. 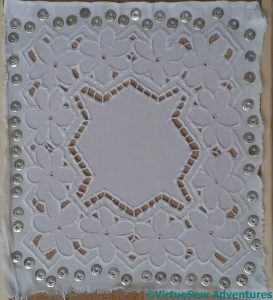 What is more, I have discovered that there are subtleties in the way the designs are put together. I couldn’t simply run the design around the piece without paying attention! In fact I have photocopied and traced, and retraced, and re-retraced(!) the design several times, trying several ways to create the complete circuit of the design, and it has reminded me of just how lucky we are now, with easy access (usually) to prepared designs, tracings, and computer software that can help us assemble the designs we create ourselves. 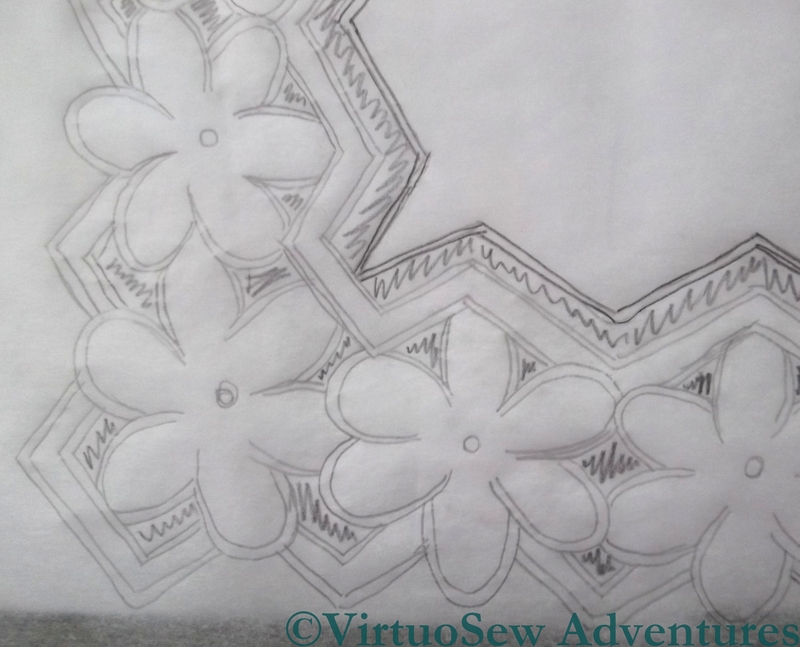 By the time I finally have the design drawn on that lovely cotton fabric I am so looking forward to embroidering, I will have drawn and redrawn each line at least eight times! My husband The Australian was at a conference in the Azores last week, and I managed to tag along. It made a lovely change from grey, chilly England, where Spring has been especially tardy this year. It was sunny, most of the time, pleasantly warm rather than cold or too hot, and when the rain did come it came in exhilarating ten-minute bursts that bounced off the pavements and vanished as quickly as it had come. Since the subject of the conference was a little beyond my reach, I spent some time sightseeing, and found a delightful needlework and haberdashery shop, right in the centre of the town, near the harbour. If only embroidery shops were so easy to find in England! Furthermore, it was so busy there was a ticketed queuing system, and four assistants to serve the customers. 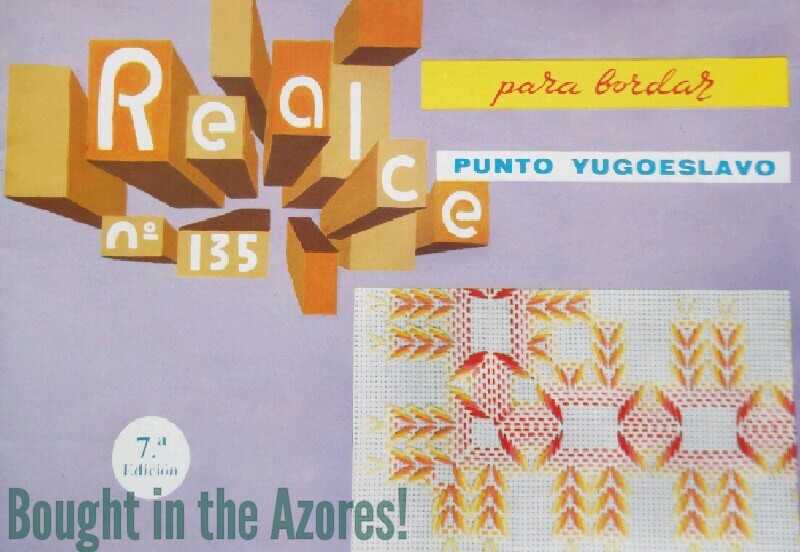 My Portuguese is limited to “Please” and “Thank You”, but in the Azores it seems that almost everyone speaks English, so I was able to explain that I am interested in embroidery and was looking for an Azorean or Portuguese project as a souvenir of my visit. 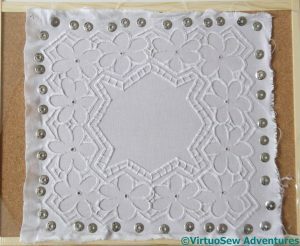 We found some patterns, and some suitable fabric and thread for the cutwork design I had chosen – a lovely crisp, fine cotton and a hank of DMC floche. 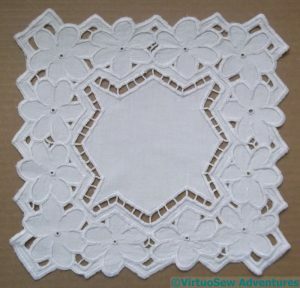 Then I found something else, and couldn’t resist it, because the eccentricity of travelling halfway across the Atlantic and then buying a book of patterns from Yugoslavia rather appealed to me! 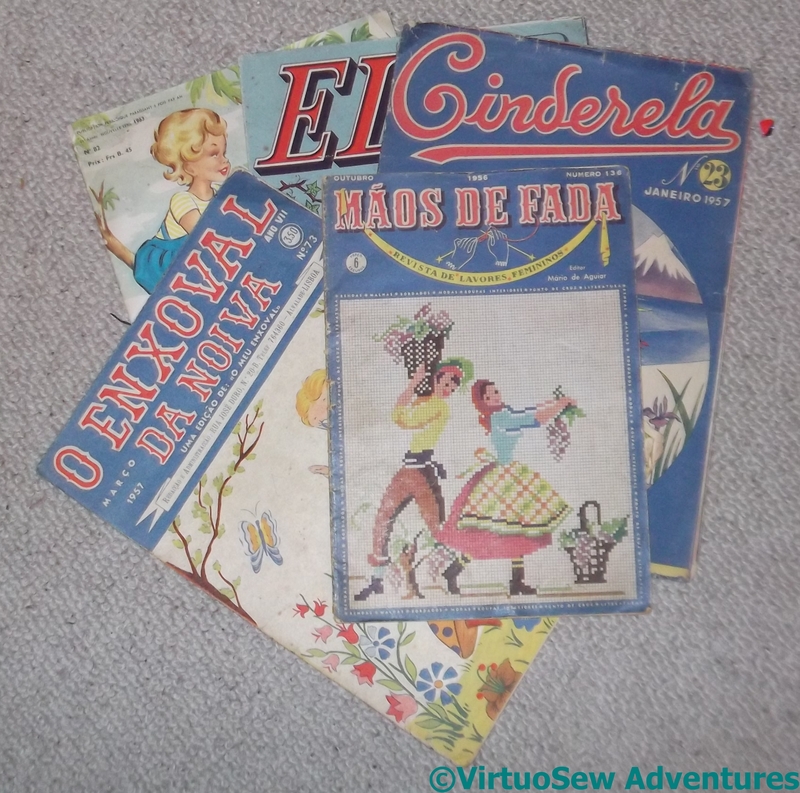 So, in total, I came back with two pattern booklets for a variety of Portuguese and Azorean embroidery styles, some fabric and thread, and an entirely unrelated booklet about a form of embroidery from Eastern Europe. As if I didn’t have enough to do!